The effects of surface tension are of central importance in many everyday phenomena: it causes small droplets of rain to stick to your windows, creates bubbles when you add detergent in your sink, and propels water-striding insects on the surface of ponds. It even induces the “tears of wine”, a ring of clear liquid near the top of the inside rim of a glass of wine from which droplets continuously form and drop back into the wine below. However, despite its omnipresence and long history of scientific observations, surface tension – and the interaction of liquids with different surface tensions – is not yet fully understood. Facing the complexity of the problem, simplified models have been used for decades. 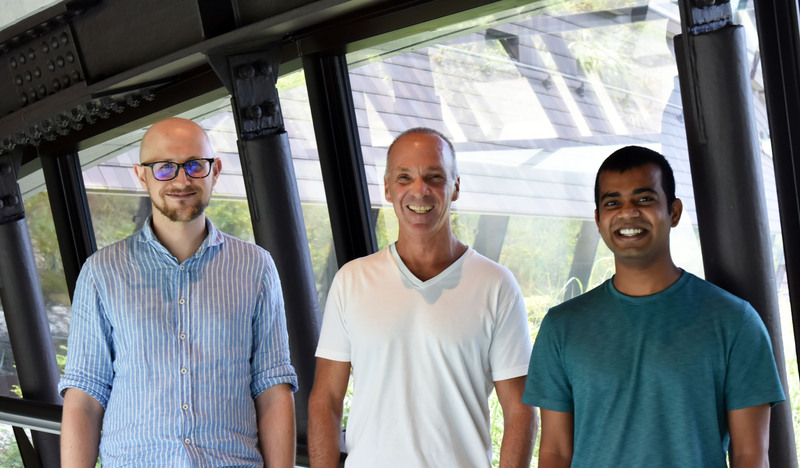 But now, OIST researchers have taken a new step toward a more complete understanding, reported in the Journal of Fluid Mechanics, by addressing an intricate property of surface tension. The outcome reveals that a commonly used approximation provides surprisingly accurate results, despite the complexity of the issue. The work is a continuation of previous studies in which OIST scientists studied the movement of acetone droplets propelled by surface tension, gliding on the surface of water. Motion of a drop of acetone on the surface of hot water due to the generation of a surface tension gradient. The researchers in the Mathematics, Mechanics, and Materials Unit headed by Prof. Eliot Fried designed a simple device in the shape of a rectangular vessel filled with water, in which a stationary cylinder is partly submerged. A surfactant – an organic molecule that decreases surface tension - is applied onto the surface of the water on one side of the cylinder, which allows the scientists to measure the profiles of the surfactant-free and the surfactant-laden portions of the water surface. These measurements helped the scientists to build a theoretical model that is used to determine the forces that act on the cylinder. The essence of the complexity lies with the geometry: the water surface curves towards the cylinder and the curvature directly depends on the surface tension. With a surfactant on one side of the cylinder, the water surface profiles on each side of the cylinder are asymmetric due to the different curvatures, which makes calculating the forces on the cylinder mathematically more complex. 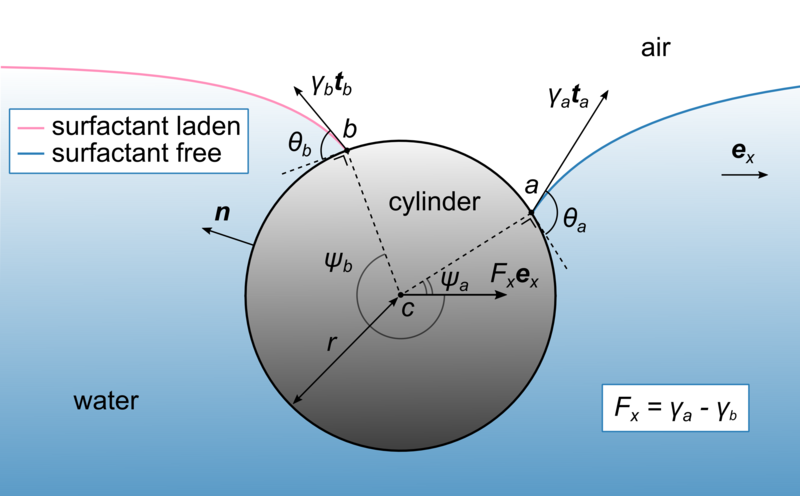 Until now, a simplified model ignored these curves under the assumption that the surface of the water remains completely flat on both sides of the cylinder. The scientists described the problem with three independent approaches: they calculated the mechanical forces applied to the cylinder first numerically, requiring the help of a computer to provide solutions for the complex equations. Inspired by the numerical results, they moved to an analytical method, also referred to as the “pen and paper” method, to confirm the model. The researchers finally analyzed the problem using a third independent approach based on energy rather than mechanical forces. All three methods lead to the same unexpected outcome: we can safely ignore the curvature of the water-air interface since the calculated forces are equal to those obtained by the simplified model, where the water surface is assumed to be flat. “We could not rule out the possibility that ignoring the curvature of the water-air interface would lead to unacceptable errors," commented Dr. Janssens. "Surprisingly, however, it turns out that the simplified model used for decades is highly accurate!" On top of solving an intricate problem, the outcome of this research provides more confidence in measurements like the Langmuir balance that has been used for the past century. Moreover, this is the first step towards understanding the complex phenomenon of an acetone droplet gliding on water because of surface tension.